In the the eleven-and-a-half years since I moved from the St. Louis area to D.C., I haven't seen my core crew of high-school buddies in many places outside of the Lake of the Ozarks for our annual summer Fantasy Football Draft. That's why it was so nice to see ET, Dewey, Scoots, and their wives for three days this month in New Orleans. 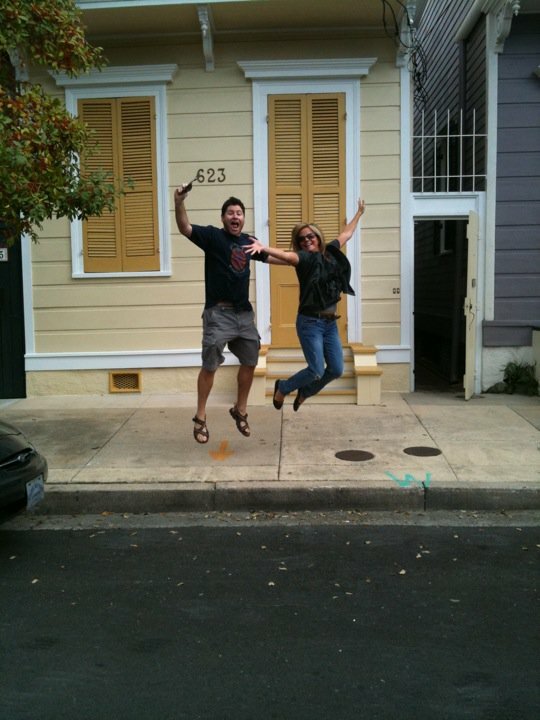 We rented a cute row house in the bohemian area of town just east of the French Quarter called Marigny (that's ET's wife, Carie Riess-Terry and I in front of the house in the photo to the right). It is one of Michael Stipe of R.E.M. 's favorite areas and he even referenced it in the Murmur classic "West of the Fields," as in, Elysian Fields, a main road though the neighborhood. Frenchman Street, in particular, has lots of great restaurants and bars that give visitors the feel of a truly different city without all the drunken nonsense of Bourbon Street. We, of course, hit Bourbon as well. But I definitely couldn't take it as much as when I visited at younger ages. 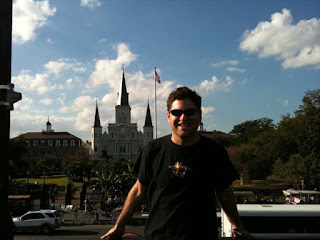 Pat O'Brien's served as some good crawfish etoufee and the Preservation Hall Jazz Band was a weekend highlight. We also got debris po' boys at Mother's, drank Pimm's at Napoleon House, drank chocory coffee and ate beignets at Cafe du Mond, ate delicious muffalettas, devoured a pricey and succulent Peppered Lamb Loin with Goat Cheese and Zinfandel Reduction Sauce at Bayona, enjoyed lots of Abita, and strolled the artist-lined Jackson Square (see the photo below). New Orleans is a great place to meet up with friends. There is plenty more we could have done, but leisurely walking around town, down back streets, and along the Mississippi River walk is a highly recommended way to spend a late fall weekend in The Big Easy. Oh, and having an easy-going, late-night boxing showdown in the courtyard behind our rowhouse with Scoots isn't too bad either.